Comes complete with, 4 or 3 X Bright Stainless Rod Holders (Models differ) with Stainless Steel Frame, Stainless shock cords, 38 Litre Chilli Bin(Blue) and all necessary mounting hardware. (Custom colour chilli bins available at extra charge) FISHING ACCESSORIES IN PHOTO,NOT INCLUDED. NO SCREWING required, all clips on within 1 minute. This system has been thoroughly tested in all conditions and is of quality New Zealand manufacturing. 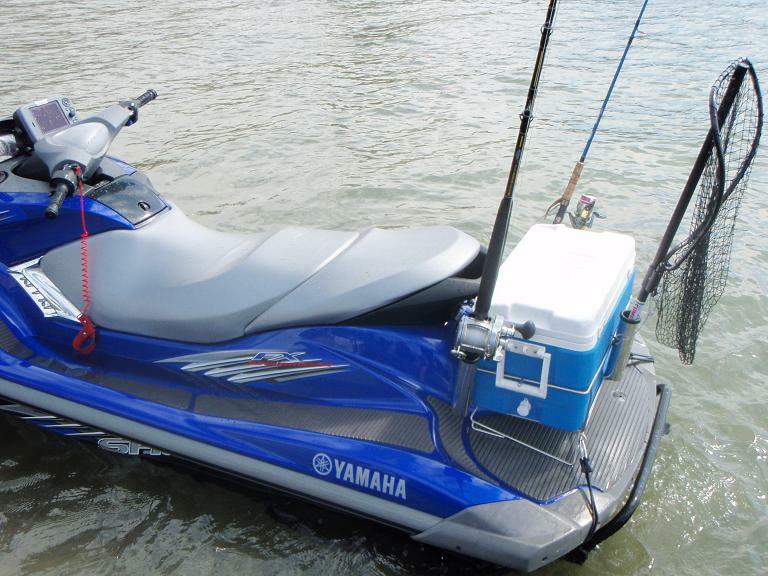 This is the ultimate accessory for your PWC and allows you to experience there is more to just wavehopping on a jetski. With jetskis being so fuel efficient and versatile to get to isolated spots quickly, many people are finally taking advantage of the easy life of jetskifishing. THESE UNITS ARE CURRENTLY IN STOCK AND AVAILABLE NOW FOR PICK UP IN AUCKLAND IF URGENTLY REQUIRED. Enjoy the fun with jetskifishing! » What is the best way to set up a rod holder on and fishcat 4 delux?